Want to sip on tea with a view of the entire city and take a tour of a palace? Then you must book yourself a High Tea at Taj Falaknuma. 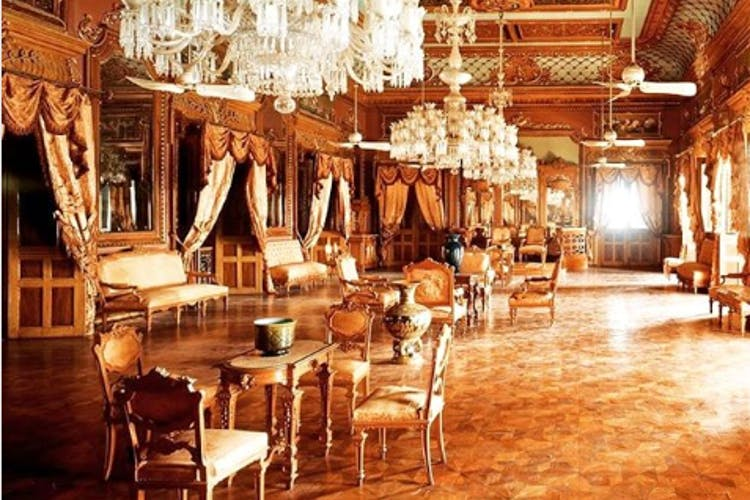 Booking yourself a High Tea at Taj Falaknuma means two things — you don’t just get to eat the delicacies and sip on exotic tea but also tour the palace with a guide in tow. The moment you step into the palace gates, you’ll be taken to the palace in a buggy but if a royal horse carriage sounds more like your thing, you can request for that too. While you can go for your high tea before or after the palace tour, we recommend going for it after the tour. We are saying this because it is amazing to experience the high tea from sunset to the night. During the tour, you will be taken through the palatial corridors of this palace. Built originally in 1894 by the Nizams, it has been restored by the Taj Hotels; however, its nobility and grandeur are kept alive. Breathing in these walls are stories full of historical significance, so touring it is nothing short of exploring a museum. After the tour, you can saunter around for a while or move on to your tea. While you book the High Tea, you’ll be presented with three options — Indian and English High Tea and the Sparkling Afternoon Tea (comes with two glasses of wine per head). While English is our personal favourite because of the scones and sandwiches, the Indian tea has samosa, tikkis etc. But if you are visiting with bae or fam, you can always have a mix of both. The menu is pre-set, but you cannot complain at all because it’s extensive. Apart from ample tea choices, you can also pick from coffee and other beverages. The English tea will offer you plenty of scones, tarts, cakes, muffins, mini sandwiches; the Indian one will surprise you with tiny delights like samosa, tikki along with an array of Indian sweets that no sweet tooth lover can refuse. And the best part? It’s unlimited. Plus, the view of the city from the balcony where high tea is arranged is to die for! While visiting the palace for a tour might be tricky without booking yourself a stay or dine at their restaurants, the High Tea experience can get you a tour as well as a dining experience at a price that’s not too heavy on one’s pocket. Plus, you can plan it for those special evenings with your bae too. Do note that you’ll have to call the hotel to make reservations. You can contact them on 040 6629 8585. Also, it’s mandatory to dress up in formals (or something equivalent). So, don’t show up in casuals as you won’t be allowed entry.